Please Help Protect Law Enforcement and First Responders - Move Over, America! 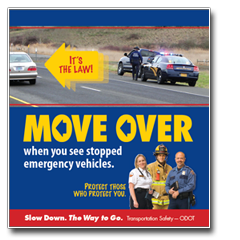 Move Over Law Implemented in 2007 and enhanced in 2011.
fail to move over when passing through the emergency zone. 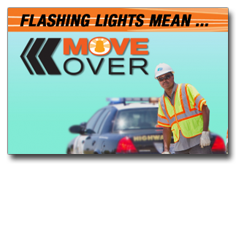 Move Over Law Implemented in 2003 and enhanced in 2010.
location is within a Safety Corridor, School Zone or Work Zone). motorists must move over if safe to do so or slow down. 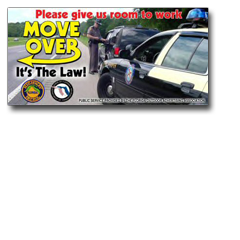 Move Over Law Implemented in 2003.
fines up to $395 and 4 points on their driver license. Move Over Law Implemented in 2006. Move Over Law Implemented in 2005. Move Over Law Implemented in 2001. Move Over Law Implemented in 2002. 2011 and violation of this law could result in fines up to $200. 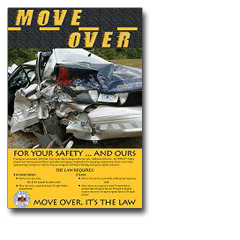 Move Over Law Implemented in 2001 and enhanced in 2009.
which is punishable by a fine of $200 and/or 60 days in jail. 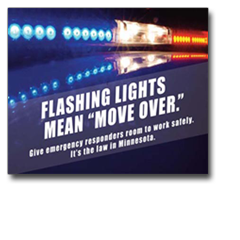 Move Over Law Implemented in 2009.
while on the shoulder of I-90 in Winona in 2000. 321.323A or 321.324 is $100, plus any surcharge and court costs. emergency vehicles to encompass some MoDOT vehicles. Violation of this law could result in fines up to $200. $260 and three demerit points added to your license. law could result in fines from $100 to $10,000. in 2004 to include wreckers and road service vehicles. and amended in 2010 to utility service vehicles. vehicles stopped on the side of the highway. and amended in 2011 to utility service vehicles. Move Over Law Implemented in 2007. Violation of this law could result in fines from $25 to $100. 1,793 times, resulting in five deaths and 419 injuries. up to $500 and 3 points on your license. Violation of the law could result in fines up to $500. Violation of the law could result in fines up to $250. of the Virginia move over law can result in a Class 1 misdemeanor. No Move Over Law yet exists. penalty of up to 500 dollars and 60 days in jail. Move Over Law Implemented in 2010.
over $100 and 2 points on your license. 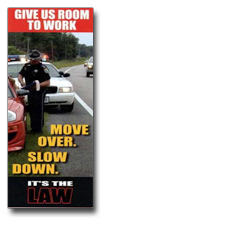 Move Over Law Implemented in 2000.
up to $150 and 3 points on your license. Violation of this law could result in fines from $100 to $10,000. Move Over Law Implemented in 2008. Failure to slow down or move over may result in a fine of $85.00. Violation of this law could result in fines up to $100.00. Fines for violating this law are $311. Honolulu Police Officers were killed in separate traffic stops. determined by the municipal court in which the violator is charged. Violators of the Move Over law can be charged with a Class F Felony. With Hawaii making the Move Over law effective in July 2012, all the states across the country have implemented progams to help make our roads safer. Please do your part and spread the word! When you see flashing lights on the side of the road, slow down, and if it’s safe, Move Over – away from police, fire crews, paramedics and tow truck drivers. If you make the move, others will follow. Stay aware of changing laws across the country. Help protect emergency responders at roadway incidents through collaboration, advocacy, networking and training. According to FBI statistics, law enforcement officers being struck and killed is a major cause of law enforcement deaths. Illinois State Police trooper Kyle Deatherage was struck by a semi and killed during a traffic stop. The crash occurred just after 9 a.m. in the northbound lanes of Interstate 55 at milepost 62, just north of Litchfield, according ISP. Trooper Kyle Deatherage, a motorcycle officer, was standing next to a car when the semi-truck hit him. He was pronounced dead at the scene. Trooper Deatherage, 32, joined the Illinois State Police on May 31, 2009. He is survived by his wife and their two children. Related Article: Hundreds honor Illinois Trooper killed in the line of duty. Police Officer Angel Garcia was struck and killed while responding to a traffic hazard. Officer Garcia is the ninth law enforcement fatality from the State of Texas in 2012. The 27-year-old El Paso police officer just nine months out of the police academy was killed Sunday morning while trying to remove a ladder from Interstate 10. Officer Jeremy Bitner was struck and killed by a drunk driver while conducting a traffic stop. During the initial stop he had the driver exit the vehicle. As the two stood in the roadway next to the car, a drunk driver sideswiped Officer Bitner's patrol car and then struck him and the other driver, throwing them both approximately 50 feet. A witness to the collision called 911 and followed the drunk driver as he fled the scene in his vehicle. Officers from the Littleton Police Department arrested him several minutes after the crash due to the witness' actions. Florida Highway Patrol - Safety tips from the Florida Highway Patrol and the Department of Highway Safety and Motor Vehicles. myCitation.com - Learn everything you need to know about your traffic ticket. Pay your traffic ticket online. Lots of resources and useful links. Ohio State Patrol - The Patrol’s Move Over and Slow Down Public Service Announcements. State of New Jersey Dept of Law and Public Safety - An overview of New Jersey Statute 39:4-92.2 and public awareness material from the Attorney General. Sheriffs.org - National Sheriffs' Association, homeland security, law enforcement, public safety. PoliceOne.com - Welcome Police Officers & Law Enforcement to the #1 Resource for Cops. Georgia Highway Patrol - Georgia's move over law saves lives. Yellow Ticket - Florida's Best Traffic School, live classes and online classes available. Approved statewide by the Florida DHSMV. NAPO.org - National Association of Police Organizations. Representing America's Finest. The leader of America's national law enforcement organizations. StateTroopers.org - Providing benefits and services to America's state troopers since 1989. 1SafeDriver.com - Driving Safety Programs, Defensive Driving and Traffic School Courses, Texas TEA Approved, New Jersey MVC Approved for point reduction. National Law Enforcement Memorial Fund - Respect. Honor. Remember.